Do you eat strawberries with sour cream and brown sugar? The first time I heard about it a few years ago I thought it was crazy. Strawberries should be eaten with white sugar. But then I started thinking about it and I wondered what I was missing. 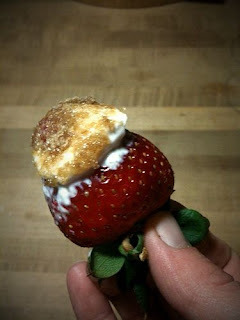 I dipped a clean strawberry in sour cream and then in brown sugar. It was heavenly. A little messy but really wonderful. Recently I was in charge of the food for a meeting of a women’s group that I belong to. It was suggested that we have strawberry shortcake for dessert. But the more I thought about strawberries the more I thought about brown sugar and sour cream. So after a little research and a few false starts Brown Sugar Strawberry Shortcake was born. If you don’t have Sour Cream Powder you can make this with fresh sour cream, just be sure to subtract the water (1/4 cup from the Brown Sugar Cream, and ½ cup from the cake). When I make this cake I use the very best brown sugar I can find. 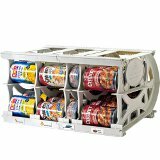 Which happens to be in my food storage. 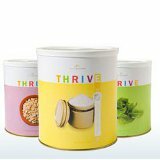 I LOVE the THRIVE brown sugar. There really is a difference in brown sugar. If all you have is 3 years old and rock hard it is time to buy some new fresh flavorful brown sugar. I did serve this to the women’s group and they loved it. I have had several requests for the recipe, which is a sure sign it was good. 2 Tablespoons Brown Sugar, plus more for sprinkling just before serving. Clean and hull the strawberries or if using Freeze Dried rehydrate in a little water. Slice the strawberries and place in a small bowl. Sprinkle with brown sugar. Mix sour cream, water, brown sugar, lemon juice and vanilla extract together. Let stand in refrigerator for flavors to combine (at least an hour or two or even better overnight). Garnish with a sprinkling of brown sugar. Cut the Brown Sugar Bundt Cake cake into slices. Place a slice of cake on a dessert plate. Spoon strawberries over the pound cake and dollop with a spoon of the brown sugar cream. Garnish with a sprinkling of brown sugar. Serve immediately. Beat cake mix, pudding, powdered eggs, sour cream powder, water and oil with mixer until blended. Add brown sugar; mix well. Pour into a bundt pan (regular size) or into a 9 x 13 inch cake pan, sprayed with cooking spray. Bake 1 hour or until toothpick inserted near center comes out clean. Cool cake in pan 15 min. Loosen cake from sides of pan; invert onto wire rack. Remove pan; cool cake completely.